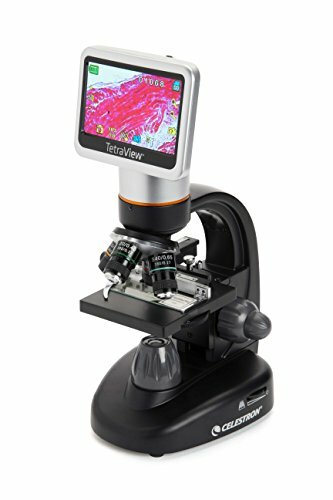 The professional-level Celestron TetraView LCD Digital Microscope is a touchscreen LCD microscope with advanced features at a reasonable price. TetraView features four fully achromatic lens objectives, a fully mechanical stage, a 4.3” TFT full color touch screen, 5MP CMOS sensor, and a 2GB SD card for storing your photos and videos. Taking high-resolution images and video of specimen slides has never been easier. The LCD screen rotates 180° so you can easily share your viewing with others. For an even bigger audience, use the TV output to display on a television or projector. With magnification from 40 to 400x (1600x with digital zoom), TetraView is ideal for viewing a range of cellular specimens on slides. Great for the discriminating professional or serious hobbyist, the TetraView microscope is an excellent tool for labs, schools, scientific research, and more.